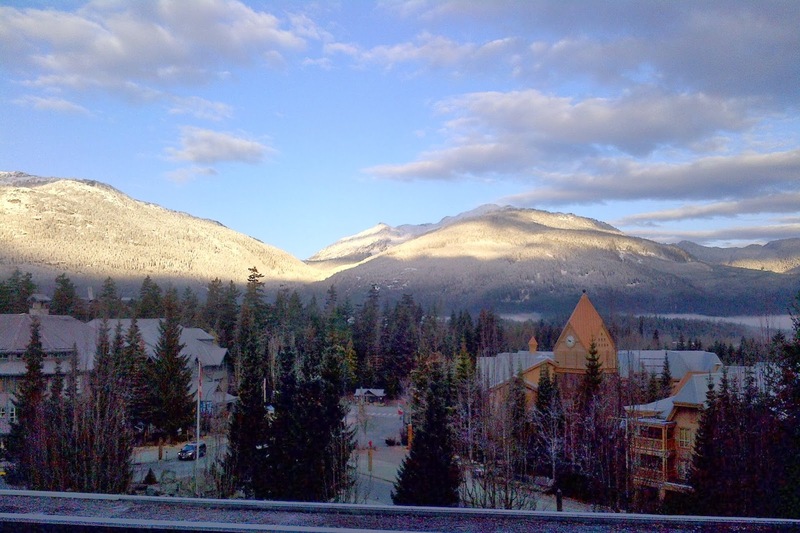 I spent this past weekend in Whistler, B.C., not skiing or snowboarding or taking part in other outdoor activities but holed up in a hotel talking politics. Lots of politics. I was there as a delegate from my riding association to the biennial convention of the Liberal Party of Canada British Columbia, the provincial association of the national party. I volunteered to go because the opportunity presented itself, and I thought it would be an interesting experience. And it definitely was. The main order of business for the weekend was to elect a new executive for the association. Many of the positions had only one candidate, so those candidates were acclaimed, but president, vice-president, and finance chair were all being contested. The most important thing I did on Friday night was to participate in a "bear pit" session in which the candidates were asked questions. Sadly, I was late, but I did see the two candidates for president answering questions. After that, I popped into the hospitality suites hosted by the candidates. Mostly those are just about drinking and socializing, but I did manage to speak with one of the candidates and got an answer to my question that pretty much convinced me to vote for him. Saturday was a full day. First there was a breakfast to honour Hedy Fry, MP for Vancouver Centre, on the 20th anniversary of her first election to the House of Commons. It was a good buffet breakfast, and Fry is an entertaining speaker. Senator Mobina Jaffer introduced herself to me and to many others in the room, and I touched base with Mary Pynenberg, who is president of the National Women's Liberal Commission. After breakfast, there was a "caucus check-in" with Fry and Jaffer, who were the only members available—Senator Larry Campbell was unable to attend, and MP Joyce Murray was acting as observer for the Liberal Party at the Conservative Party of Canada convention in Calgary. As you can see, the Liberals are not currently doing well in B.C. But the session was lively, with good answers to questions from both Fry and Jaffer. I then participated in a workshop on formulating an "elevator pitch"—a very brief statement of why you're a Liberal and why anyone should vote for us. The convention took place at the Fairmont Chateau Whistler, and the staff did an excellent job of facilitating the proceedings. The breakfast buffet had been very good, and the lunch buffet was even better. Lots of variety, local produce (nearby Pemberton is known for potatoes and other vegetables), labels for various dietary restrictions, and all delicious, including the pecan pie, of which I should not have had a second piece (but it was so good). There was some business during lunch, followed by a very entertaining and informative talk by Scott Stratten, the "unmarketing" guru. His examples of social networking gone both wrong and right were great! After that, I went to a workshop run by Ryan Adam, who had worked for Obama for America in both 2008 and 2012. Great lessons to be learned there about engagement and getting people on your side. Following that, I got to hear brief speeches from all the candidates who were contesting offices, so that helped make up for my having missed part of the bear pit session. I skipped on the "red tie gala" dinner to have a wonderful dinner with Sweetie at Araxi. We needed some time together! 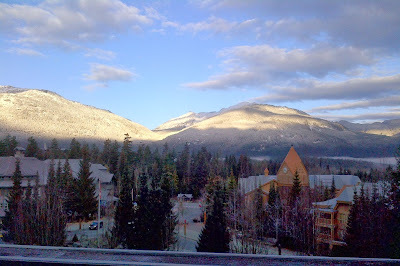 She had been amusing herself quite well in Whistler Village and at the hotel taking advantage of the facilities. Later it was time for more hospitality suites, this time hosted by candidates for national party executive offices, the vote for which will be at the national convention in Montreal in February. On Sunday, we got to fall back! I don't like Daylight Saving Time, but if you're going to pick a weekend to fall back, that was the right one. I hadn't stayed up too late, but it was still nice to have that extra hour. I participated in one workshop in the morning on policy, hosted by national policy chair Maryanne Kampouris. She kept us very interested, and answered many questions. After the workshop, we had a really short annual general meeting, which mostly consisted of the outgoing president's report and a finance report. Around noon, the result of the vote was announced and the new executive team brought to the stage. After a brief speech from the new president, Braeden Caley, we were on our way. I learned a lot over the course of the weekend. I met people from all over B.C. I have a better understanding of how the party is organized at both the riding level and the provincial level. I learned that I might just be a policy wonk (loved that workshop), and I know I want to be more involved with the Women's Commission. I got to make policy suggestions. I learned that a lot of Liberal delegates, both younger and older, are very stylish, not just the women but the men as well. I could have indulged my inner fashionista even more! In hindsight, I should have found a way to get in touch with the few other delegates from my riding, although I did manage to find one person. One thing I learned is that I am not a person who eats, drinks, and breathes politics. For so many of the delegates, politics is their lives. I am very interested in politics and have been for most of my life, but not quite at the same level as the "keeners." As social a person as I am, it's not quite a natural fit for me. I am still a musician first, and I don't think there were many if any others quite like me at the convention. But I do think it's important for people to be involved, and I will continue to be involved. I know I'm interested in policy. I'm a good worker bee when it comes to things like campaigns. I might find some way to participate directly at the riding level. I think it's vitally important for Canada that the LPC return to government, and I want to do what I can to help that to happen. I think that most Canadians still believe in Liberal policies. They just don't realize they do, because first we screwed up and lost their trust, and then we allowed the other parties to define us. No more of that! We have less than two years to engage the electorate, riding by riding. We will. And I will help.